2017 has been a very exciting year for the Rachel Barton Pine (RBP) Foundation! We have a new website, www.rbpfoundation.org, and all of our social media pages have been updated; please be sure to like and follow us on Facebook and Twitter. Thanks to your help, we are on target to publish our first Music by Black Composers (MBC) sheet music book this spring! After collecting and evaluating more than 900 pieces over the last 12 years, we’ve selected 23 pieces by 17 composers for Violin Volume 1. The RBP Foundation’s MBC series will be more diverse in every way than any other pedagogical collection for violin. In just this one volume, the repertoire spans from 1767 to 2014 and comes from the United States, Puerto Rico, Cuba, Jamaica, Brazil, England, France, Ghana, and Nigeria. Two of the composers are women. 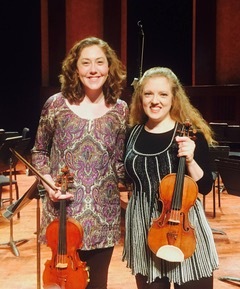 In addition to the compositions, Violin Volume 1 will include biographies of each composer, piano accompaniments, and violin duet parts, and profiles of three inspiring African-American professional violinists: soloist Tai Murray, Suzuki teacher Lucinda Ali-Landing, and entrepreneur Aaron Dworkin. We will also include two feature articles: a discussion of Black American orchestras past and present, and the stories of important African Americans who play or played the violin as an avocation – including Frederick Douglass, Solomon Northup (author of Twelve Years a Slave), George Washington Carver, Coretta Scott King, and Sheila Johnson, founder of the Black Entertainment Network. The history of classical music and violin playing is clearly not limited to White European men! In addition to the sheet music book, we are developing two other educational resources: a coloring book featuring approximately 40 of the most important Black composers from the 18th-21st Centuries, and a timeline poster featuring more than 250 Black composers. Both will be inspiring for children studying music, as well as for any young person interested in learning more about Black history. We expect to release them at the same time as our Violin Volume 1. As exciting as all of this is, it is just the beginning and there is a lot of work yet to do. We have hundreds of wonderful, yet neglected, pieces from all over the world that will fill seven additional volumes for intermediate and advanced violinists. These books will introduce young artists to composers like William Grant Still (the first African-American composer whose symphony was performed by major orchestras), George Walker (the first African-American composer to win a Pulitzer in music), 19th-Century Cuban composer Brindis da Salas (“the Black Paganini”), and Fela Sowande (“the father of Nigerian art music”), as well as younger stars like Daniel Bernard Roumain and Jessie Montgomery. Feature articles need to be written on such important topics as Black symphony orchestras in Africa, classical sampling and violin playing in hip-hop, and classical music at HBCUs. We also hope to commission a handful of prominent Black composers who haven’t yet written any pieces for violin. Royalties from the sales of our books and educational materials will not be enough to fund MBC’s continued efforts. Please help us make MBC’s publications a reality! Visit www.musicbyblackcomposers.org to learn more about our important work and how you can help. Nearly 100 young artists have benefitted from our Instrument Loan Program and Grants for Education and Career. Thanks to your generous past support, our alumni are building thriving careers. 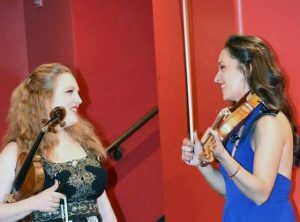 I recently had the pleasure of performing in Ohio with Joanna Frankel, concertmaster of the Columbus Symphony, and in New York with Karla Donehew-Perez, violinist of the Catalyst Quartet. 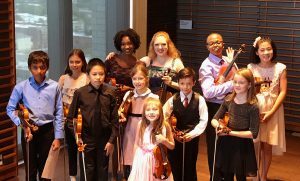 The RBP Foundation’s Instrument Loan Program unites high-quality string instruments and bows with students and young professionals ages 6-29. Some of these fine instruments are owned by generous families and individuals who loan them to the RBP Foundation, and others are gifts to our permanent collection from instrument makers, inheritors, and retirees. Access to high-quality instruments gives these deserving young artists a voice with which to express themselves and an opportunity to fulfill their potential. The RBP Foundation’s Grants for Education and Career program remains unique in helping young artists. Most young musicians in struggling financial circumstances can obtain scholarships and financial aid at their music school. But there are numerous additional costs that must be paid for out of pocket, including supplemental lessons, entrance fees to competitions, audition recording sessions, travel expenses for competitions or auditions, sheet music purchase, piano accompanist fees, and instrument repair and maintenance. Every year, the Grants for Education and Career program provides awards to assist with these often-overlooked expenses. This year, we converted the application process for our young artist programs to a completely online platform, making it easier for young artists to submit their materials and easier for us to receive them. Our most recent application period ended on December 1. We are excited to review the submissions and look forward to sharing news of our new recipients with you in our Spring Newsletter.